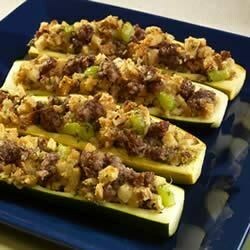 "Summer squash are stuffed with a savory mixture of sausage and stuffing then baked until the squash is tender and the stuffing is nicely browned." In large skillet over medium heat, crumble and cook sausage until brown. Add onion and celery and cook until tender. Meanwhile, cut squash in half lengthwise and scoop out seeds, leaving 1/4 shell. Place in large baking dish and sprinkle with salt and pepper. When sausage is done, remove from heat and stir in stuffing and water. Stuff each squash half with some of the sausage mixture. Cover pan and bake 20 minutes. Uncover and bake and additional 10 to 20 minutes or until squash is tender and stuffing is browned. It was ok but it is missing a lot. Maybe some corn, mushrooms, or something.